History: He may not have had a long run in the WWF, nor will he ever be considered one of the best physical specimens ever to come through the door of professional wrestling. But one thing you can't ignore is that Rodney Anoia, for a short period, reached the top of the wrestling world. For a time, he was the best in the business. Anoia's career in professional wrestling began as he grew up, in a family full of wrestlers. His uncles were the Wild Samoans, Afa and Sika, who trained him at an early age in the family business (Anoia was also related to other WWF superstars, like Rikishi Phatu and the Rock). Anoia then took on the name of the Great Kokina, while wrestling overseas in Japan. He also spent some time in Mexico, learning the craft, and gaining the experience necessary to be a star in the sport. His first major exposure in the United States came out of the AWA, as Kokina Maximus. He was managed by Sheik Adrian Al-Kaissie, wrestling as a Samoan superstar. At the time, he weighed less than 400 pounds, making him a lean wrestling machine. Unfortunately, Kokina Maximus never was a great success in the AWA, and when it closed, he once again left America to wrestle overseas. 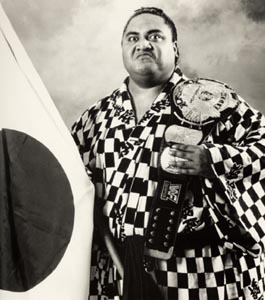 In 1992, Anoia was contacted by Vince McMahon and the WWF, and offered a chance to create a new character: Yokozuna. With Mr. Fuji as his manager, and Jim Cornette as an 'advisor', Yokozuna was announced as a sumo wrestler from Japan. He wore extra padding in his trunks at first, to show off his bulk, even as he worked to gain the weight required for the role. His first PPV victory came at the Survivor Series, when he squashed the much-smaller Virgil. Soon, Yokozuna's career took off, as he headed into the Royal Rumble in 1993 as a potential favorite. With a late draw, coming in as 27, Yokozuna quickly became a major factor, eliminating Tatanka, Carlos Colon, Earthquake and Tito Santana in order. Later on, he threw out Owen Hart, Bob Backlund and "Macho Man" Randy Savage to win the Rumble, announcing his movement towards main event status. At Wrestlemania IX, Yokozuna faced off against Bret "The Hitman" Hart, for the WWF World Heavyweight Championship. During the match, Hart seemed to be in control, locking on the Sharpshooter, until Mr. Fuji threw salt into the champion's face. Hart, blinded, was then taken out by Yokozuna, who shockingly won the World Title. As he and Mr. Fuji celebrated, Hulk Hogan came out from the back to protest the decision. Mr. Fuji then arrogantly challenged the Hulkster, and Hogan accepted, quickly defeating Yokozuna in less than a minute to take the belt away. This gave Yokozuna one of the shortest title reigns in the WWF's history. Yokozuna and Hogan continued to feud for the next few months, leading up to the first King of the Ring pay-per-view. Once again, Hogan seemed to be in control. But once again, the champion underestimated the deceitful tactics of Mr. Fuji. A Japanese photographer, planted at ringside by the group, aimed at the Hulkster and pressed the button, shooting a blast of fire into his face. This allowed Yokozuna to take Hogan out and reclaim the World Title, in what could be considered his greatest victory ever. Soon after, the Hulkster left the WWF to "find his smile", which Yokozuna took to mean that he had killed Hulkamania. To celebrate, he held a "Bodyslam Competition" aboard the USS Intrepid on Independence Day. Many wrestlers and athletes alike tried to slam Yokozuna, with no success. Just as Yokozuna was thinking that there would be none to challenge him, however, Lex Luger stepped forward, picked him up, and slammed him on the deck, showing great strength. This made Luger the next major challenger to Yokozuna's title reign. At Summerslam '93, Yokozuna and the newly-reborn patriot Luger fought it out for the World Title. Luger took control late in the match, scoring on Yokozuna with a flying forearm. Luger had long been said to have had metal plates put into his arm, making it a formidable weapon. Yokozuna was knocked out of the ring, unconscious, and lost via countout. Unfortunately for Luger, the title did not change hands. But it made it seem like Luger had a chance against the humongous foe. They continued to feud up to the Survivor Series, where each chose a team of allies for an elimination match. Yokozuna chose the Rougeau Brothers and Ludwig Borga, to form an international team of wrestlers that hated America. Luger brought in true Americans in the undefeated Tatanka and the Steiner Brothers. These teams would change soon, though, as Yokozuna and Ludwig Borga attacked Tatanka during a match, both ending his winning streak and injuring his ribs from a Banzai Splash. Luger then put one of the Rougeaus, Pierre, out of commission with his flying forearm. Both teams found a replacement, as Crush joined Yokozuna's team, while the Undertaker surprisingly sided with Luger. The Foreign Fanatics and the All-Americans met up at the Survivor Series ready for war. The first to fall was Rick Steiner, who was beaten by Ludwig Borga. The Foreign Fanatics soon took a harsh blow, though, as Crush was counted out, due to being distracted by his rival at the time, "Macho Man" Randy Savage. A few minutes later, things got worse for Yokozuna's team, as Luger eliminated Jacques Rougeau. This forced Yokozuna to take a more active role, as he came in and managed to take out Scott Steiner. Yokozuna & Borga then punished Luger for a time, before Luger was able to make the tag to the Dead Man, the Undertaker. Both Yokozuna & Borga seemed to be overwhelmed by the Undertaker's power, as he managed to sit up from a Banzai Splash. For the first time in his career, Yokozuna looked terrified. The fight went to the outside, with Yokozuna throwing everything he could at the Undertaker, yet not fazing him. Both men were counted out, leaving it up to Borga and Luger, who used his flying forearm for the victory. The actions of this match led to a feud between Yokozuna and the Undertaker, where the sumo champion seemed to be completely overmatched. He eventually was forced to accept a Casket Match with the Undertaker at the 1994 Royal Rumble, where all the odds looked to be in the Undertaker's favor. However, after a lengthy match, Mr. Fuji called out the troops, bringing a dozen wrestlers out to attack the Undertaker along with Yokozuna. After a lot of struggle (as well as damaging the Undertaker's "magic" urn), the group managed to shove the Undertaker into the casket, giving the win to Yokozuna. As they celebrated afterwards, however, a mysterious figure appeared on the Titon Tron, looking like the Undertaker inside the casket. He opened his eyes and talked about how the Undertaker would not rest in peace, then disappeared in a fireworks show, rising to the top of the Titon Tron and vanishing. It was, to say the least, one of the most 'spiritual' endings to a match in WWF history. Going into Wrestlemania X, having dealt with the Undertaker, Yokozuna seemed more confident than ever in himself. He continued his long-running feud with Lex Luger, facing off against him once more at the pay-per-view. Thanks in part to Mr. Perfect being the special guest referee, Yokozuna won, via DQ, over Luger. However, later in the night, Yokozuna was forced to defend the World Title again, this time against the former champion, Bret "The Hitman" Hart. With "Rowdy" Roddy Piper stepping in as the special referee, Yokozuna had little chance for victory. Hart got the pinfall victory, finally taking the World Title away from the long-running champion. Yokozuna's main-event status soon began to fade away, as he never again fully challenged for the World Title. He began tagging briefly with Crush, another Mr. Fuji star, but they were unable to take the Tag-Team Titles away from the Headshrinkers. Yokozuna then had to deal with the 'rebirth' of the Undertaker, who immediately came after the foe that had taken him out of action. The two met in another Casket match at the 1994 Survivor Series, this time with actor/karate expert Chuck Norrus as the special referee, to keep the other wrestlers away from ringside. Without their help, Yokozuna could not win, and eventually ended up locked inside the casket. This was Yokozuna's last hurrah in the WWF for a time, as he wrestled only briefly on the mid-card before taking some time off. In April '95, Owen Hart began promising that he would have a great tag-team partner to face off against the Smoking Gunns at Wrestlemania XI for the WWF Tag-Team Titles. At the event, Yokozuna became known as his partner, and the surprisingly-diverse tag-team managed to take out the Gunns and take away the gold. The two would remain a tough tag-team for a few months, defending against teams like the Allied Powers (Luger & Davey Boy Smith), the Smoking Gunns and others. Still, by this point it was obvious that Yokozuna was no longer in great shape, having gained too much weight. 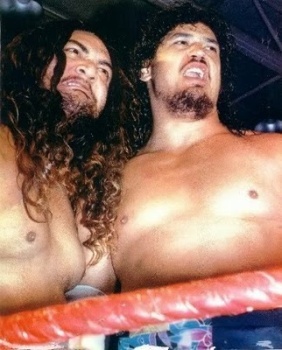 Hart carried the team, much like Haku carried the Colossal Connection when Andre the Giant was faltering. In September '95, Yokozuna teamed up with Davey Boy Smith to take on Shawn Michaels and Diesel, with the belts on the line. During the match, Owen Hart came to the ring, only to be pinned by Diesel. The next day, due to protests from the team, President Gorilla Monsoon reluctantly returned the belts to Yokozuna & Hart, since Hart was not an official part of the match. Unfortunately for the team, their second reign was much shorter, as the Smoking Gunns defeated them that night for the belts. This put an end to the team, with both going their separate ways. Yokozuna would have very little more success in the WWF. He competed in the 1996 Royal Rumble, managing to eliminate three wrestlers (Bob Backlund, King Mabel and Squat Team #2) before being tossed by Shawn Michaels, the eventual winner. Soon after, Yokozuna dropped Jim Cornette and Mr. Fuji and began a short face stint, speaking English to the fans and challenging newcomer Vader to numerous matches. The feud took a painful turn a few months later, when Vader jumped on Yokozuna's leg, supposedly breaking it. A forklift had to come down to ringside to lift Yokozuna out, showing how his weight had gotten out of control. He took some time off to slim down, then reappeared at Summerslam '96, facing off against a relative newcomer in Steve Austin. Yokozuna took the advantage near the end of the match, but when he went for the Banzai Splash, the rope broke, sending him crashing back down. Austin then got the easy victory, stabbing another knife into Yokozuna's career. He would appear at one more WWF pay-per-view, still going after Vader in the Survivor Series, but that match ended with all remaining wrestlers being disqualified, a very strange ending. 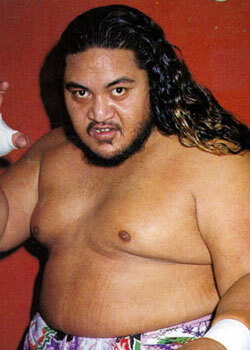 Yokozuna stayed on the WWF roster for a while afterwards, as he worked to lose the weight that he had put on. Despite dropping a reported one-hundred pounds, though, he still could not lose enough to satisfy the WWF officials. He was still too heavy, nearly 600 pounds, and could not move fluidly in the ring as he once had. He was eventually released from the WWF, although rumors persisted for many years that he would be brought back if he lost enough weight. Alas, that was never meant to be. Yokozuna appeared infrequently on the independent circuit, while also wrestling overseas in the UK at times. He made an appearance on the Heroes of Wrestling pay-per-view in 1999, but barely even touched the wrestling mat, as his tag-team partner, Jake "The Snake" Roberts, did the majority of the work against King Kong Bundy & Jim "The Anvil" Neidhart. A year later, while on tour in Great Britain for "WrestleMania 2000" (not connected with the WWF), Rodney Anoia was found dead in his Liverpool hotel room on October 23rd, 2000, only weeks after celebrating his 34th birthday. Yokozuna will always be remembered by WWF fans for his size and sheer power. For a time, it seemed that no other wrestlers could touch him, as he ran rampant on the top of the federation's heavyweight ladder. He may not have had the longevity of other champions, but Yokozuna definitely was a wrestling superstar. In 2012, he was posthumously inducted into the WWE Hall of Fame, showing the impact he had on the sport. - AWA SuperClash IV (April 8, '90) = Kokino Maximus was beaten by Nord the Barbarian. - WWF Survivor Series '92 = Yokozuna defeated Virgil. - WWF Royal Rumble '93 = Yokozuna won the Royal Rumble. - WWF Wrestlemania IX ('93) = Yokozuna defeated Bret Hart to win the WWF World Title. Shortly thereafter, Yokozuna lost the belt to Hulk Hogan in an unscheduled match. - WWF King of the Ring '93 = Yokozuna took down Hulk Hogan to regain the WWF Heavyweight Title. - WWF Summerslam '93 = Yokozuna lost, via Countout, to Lex Luger. 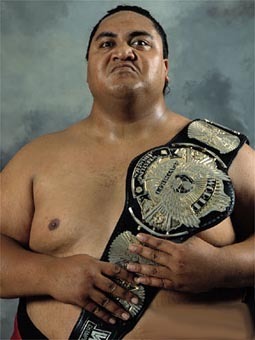 Yokozuna kept the WWF Title. - WWF Survivor Series '93 = Yokozuna, Ludwig Borga, Quebecer Jacques & Crush fought in an "Elimination" Match against Lex Luger, the Undertaker & the Steiner Brothers. Yokozuna was counted out. Luger was the sole 'survivor'. - WWF Royal Rumble '94 = Yokozuna won a "Casket" Match over the Undertaker. - WWF Wrestlemania X ('94) = Yokozuna won, via DQ, over Lex Luger to retain the WWF Title. Mr. Perfect was the special referee. Later that night, Yokozuna lost the WWF Title to Bret Hart, with Roddy Piper as the special referee. - WWF King of the Ring '94 = Yokozuna & Crush were beaten by the WWF Tag Champs, the Headshrinkers. - WWF Survivor Series '94 = Yokozuna lost a "Casket" Match to the Undertaker. Chuck Norrus was the special referee. - WWF Wrestlemania XI ('95) = Yokozuna & Owen Hart won the WWF Tag-Team Titles from the Smoking Gunns. - WWF In Your House (May 14, '95) = Yokozuna & Owen Hart retained the WWF Tag-Team belts, beating the Smoking Gunns. - WWF King of the Ring '95 = Yokozuna lost, via Countout, to Savio Vega. - WWF In Your House II (July 23, '95) = Yokozuna & Owen Hart stayed the WWF Tag Champs, beating the Allied Powers. - WWF In Your House III (September 24, '95) = Yokozuna & Davey Boy Smith (subbing for Owen Hart) lost the WWF Tag Titles to Shawn Michaels & Diesel when Diesel pinned Hart. The belts were later returned, since Hart was not a legal participant in the match. - WWF In Your House IV (October 22, '95) = Yokozuna fought to a Double Countout with Mabel. - WWF Survivor Series '95 = Yokozuna, Owen Hart, Razor Ramon & Dean Douglas fought in an "Elimination" Match against Shawn Michaels, Davey Boy Smith, Ahmed Johnson & Psycho Sid. Yokozuna was eliminated by Johnson, who 'survived' along with Michaels & Smith. - WWF In Your House V (December 17, '95) = In a dark match, Yokozuna, Isaac Yankum & the Bodydonnas were beaten by Barry Horowitz, Hakushi & the Smoking Gunns. - WWF Royal Rumble '96 = Yokozuna competed in the Royal Rumble, which was won by Shawn Michaels. - WWF In Your House VI (February 18, '96) = Yokozuna won, via DQ, over Davey Boy Smith. - WWF Wrsetlemania XII ('96) = Yokozuna, Jake Roberts & Ahmed Johnson fell to Owen Hart, Davey Boy Smith & Vader. - WWF Kuwaiti Cup Tournament (May 8-12, '96) = Yokozuna lost in the first round to Owen Hart. Ahmed Johnson won the tournament. - WWF Beware Of Dog (May 26, '96) = In a dark match, Yokozuna defeated Vader. - WWF Beware Of Dog II (May 28, '96) = Yokozuna fell to Vader. - WWF Summerslam '96 = In a dark match, Yokozuna lost to Steve Austin. - WWF Survivor Series '96 = Yokozuna, Flash Funk, Jimmy Snuka & Savio Vega fought in an "Elimination" Match against Vader, Faarooq, Razor Ramon II & Diesel II. The match ended in a No-Contest, with all remaining wrestlers being disqualified. - Heroes of Wrestling (October 10, '99) = Yokozuna & Jake Roberts were beaten by King Kong Bundy & Jim Neidhart. - WWE WrestleMania XXVIII (April 1, '12) = Yokozuna was posthumously inducted into the WWE Hall of Fame.